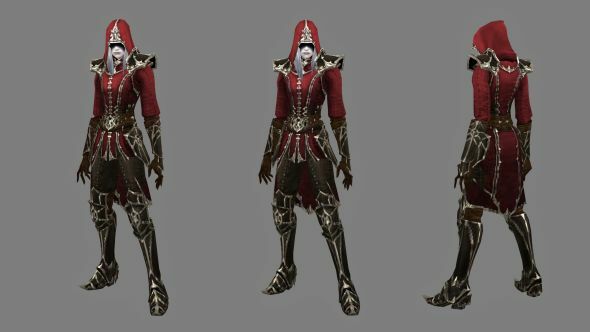 Blizzard have revealed a few more details about the elusive Necromancer class being added to Diablo III. Due for release in the second half of this year – though still without any specific date or price – it’s the first piece of paid DLC the game has received, not counting the full expansion and total rework that was Reaper of Souls. Being a full class, it has more to offer than just the build shown off at BlizzCon last year. Check here for our thoughts on Diablo’s anniversary event. First up is the female version of the character, who is every bit as ‘80s rockstar album cover as her male counterpart. She’s sarcastic and cruel, as you might expect of someone who spends most of their time hanging out with blood golems and raised skeletons. Blizzard once again want to highlight that this is a ‘proper’ class: she’ll have her own dialogue and interactions through all of the main story, and they say that followers have some particularly on-point reactions to the darker nature of the Necromancer’s attitude. There’s also a new build to see, focused around Blood Nova. This is a massive AOE spell, a ‘spender’ for cashing in on the Necromancer’s version of mana, Essence. However, Blood Nova’s big sell comes from also costing you HP, draining your lifebar to make a particularly deadly explosion. This is a second method in which Blizzard are looking to make the Necromancer unique, particularly from the Witch Doctor, along with the focus on pets that take commands. It’s supported by a further range of newly revealed abilities. A rune for the Blood Golem pet allows it to teleport around, sucking the life out of nearby enemies and restoring it to you. This combined with Leech, a new curse that means all damage dealt also restores some life, makes it rather challenging to die at all, even when spamming Blood Nova. Leech will also affect any allies present, keeping them healthy and proving a great boon to anyone else using their HP for offense. Finally there’s a new use for the corpses enemies drop, the final piece of the Necromancer’s grisly arsenal. Rather than blowing them up with Corpse Explosion, which is going to be extremely hard to resist, Devour turns them into essence and health, refueling you for another attack on their former chums. Given the rate at which Devour restores resources, it’s entirely possible the new ‘builder’ Grim Scythe – you can probably guess what it does based on the picture – won’t be needed, and skill builds that have all their slots dedicated to big damage spells with pets will be possible and viable. 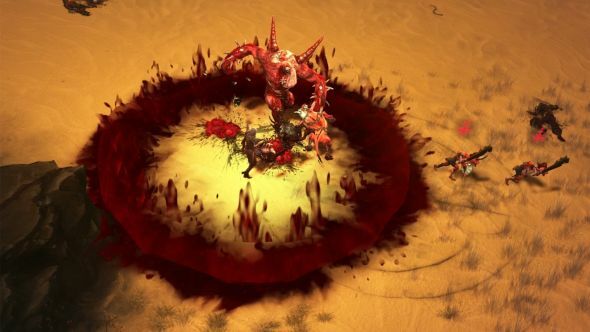 Chances are that at the highest level of Diablo’s Greater Rifts and Torment difficulties, any damage received is going to spell death most of the time, making the self-heals less useful. However, health as a resource is clearly within the Necromancer’s wheelhouse, so Blood Nova and whatever other skills wait in the wings still keep this useful. As for how it played: it’s still fun. There’s still a basic, human pleasure to take in pressing the buttons, watching hordes of enemies explode, and scattering gold and items across the battlefield. 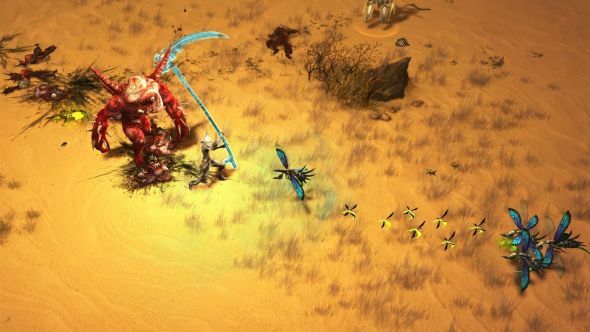 Diablo won’t ever lose that, the team having built an engine – both in terms of mechanics and graphics – that quickly moves you forward to the next group of legendary pinatas in a way that hasn’t gotten old in the half-decade since the base version launched. However, it also made clear that this is nothing you haven’t seen before. 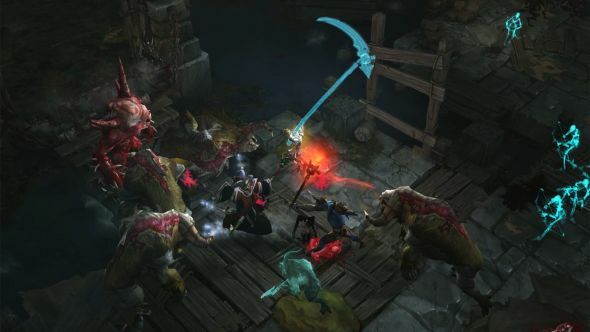 The black-clad flavouring and stench of death the Necromancer brings is a welcome new skin for Diablo’s pop-the-goblin gameplay, but if you’ve tired of it, you’re unlikely to see another full playthrough to the end. Other elements of the full update, which Blizzard have confirmed will come to PTR for a lengthy testing period before release, are similar – stash tabs, cosmetics and even new levels all designed for long-term, enfranchised players that want some spice but not a whole new meal. Frankly, Diablo does not have as many of those as Blizzard’s other major titles. And that’s fine. It is good content that will satisfy anyone who buys it, assuming the price isn’t overblown. However, it’s certainly not everything the team is working on. Even if they won’t say it plain, it’s clear that a still-hiring, full team of people is not just working on a single character and their skills. 20+ abilities, five runes each, a full pass of passives, sets and legendaries is a lot of work, but it’s not keeping a team large enough to make Reaper of Souls or Diablo III comprehensively occupied. We’re a long way out from a Diablo 4, but its existence is at this point all but assured, including various job postings pointing to it. Pried for information about further DLC, plans for development in 2018 or anything else about the game’s future, developers prove unrelentingly silent. “This month is going to be the three-year anniversary of Reaper of Souls, in May it’s going to be five years of Diablo,” says Foote. “The fact we’re still able to work on this content and show off amazing things like the Necromancer is a testament to Blizzard and our team that we’re still passionate and engaged. To the players that are still here and they still want to play our game, it’s fantastic. “Right now, our team is just so focused on getting the Necromancer rock solid for release that it’s our primary focus. Beyond that we don’t really have any announcements.” I’d hope they’re on the way soon.